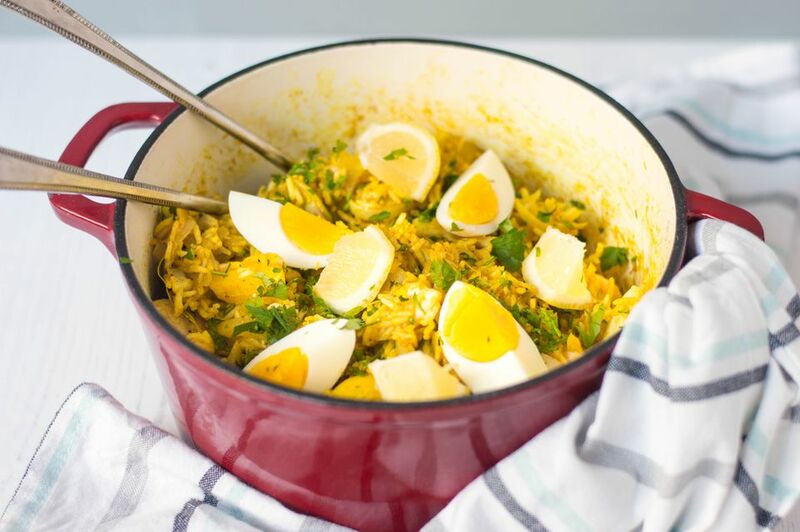 Kedgeree is one of those classic recipes which has made its way into British Food without question as to its origins, or the name, which is unusual. The dish is considered a traditional British food though, in fact, it originated in India. With curry and rice, eggs, and smoked fish, it is easy to see the Indian influence running through it. Kedgeree began its life as khichari, a dish of rice and lentils in India. It slowly transformed into the current dish during the time of the British Raj with those returning from their time in the sub-continent bringing it with them until slowly it became part of the food of these isles. It is considered a breakfast dish, but enjoyed for a light lunch, and it has even been known to be eaten for dinner as well. Why not? It IS delicious. Bring a small saucepan of water to the boil, add the eggs, and turn down to a gentle simmer for 3 minutes. Remove the eggs from the heat, cover with a tight-fitting lid, and leave for 10 minutes. Remove the eggs from the water, peel, and keep to one side. In another large saucepan, put the rice with 1/2 pint of cold water and a pinch of salt. Bring to the boil, turn the heat down to a simmer, cover with a lid and cook for 5 minutes. Remove the pan from the heat and keep covered for a further 10 minutes. Melt the butter in a large roomy pan or casserole dish, add the onion, cover with a lid and cook gently until the onions are soft - approximately 10 minutes. Place the fish in another large saucepan, and cover it with the milk. If the milk doesn't cover the fish, add little boiling water. Bring to the boil, turn the heat down, and cook the fish, uncovered, for 6 minutes or until the thickest part of the fish turns opaque. Take the fish from the milk and remove any skin and bones. To the onions, add the curry powder, cardamom, and bay leaves. Cook for 2 minutes, then add the rice. Stir well. It should be a lovely golden color throughout. Flake the fish into large chunks, then add to the rice and onions. Quarter the cooked eggs, add to the rice, and stir gently, reserving 4 of the quarters for decoration. Add the lemon juice, season with a little salt and pepper, and stir again. Sprinkle with the chopped parsley and serve immediately garnished with the eggs and lemon wedges if using.